parentwin: My Five Year Old Is NOT a "Strong Leader"
As I walked with my children to school an hour ago, in between paying exactly equal attention and lavishing exactly equal praise to my twins so that they would remain in a human-like mood at least until we got to the big doors, I readied myself for a talk I needed to have with one of the girls' teachers. As anyone who knows us knows, my girls are scare-quote spirited. We'd been coming off a long stretch of normality, where the girls would play together nicely for hours, accept reality as it came their way, and just generally showed a maturity I knew was too good to last. But this past week has been an abomination. There are lots of reasons for this. 1) School is drawing to a close, so their schedules during the school day have been disrupted with activities they are unused to. 2) The dentist told them they needed to stop sucking their thumbs, which, until this point, had been a major source of comfort and security to them. And my kids? They've wills of steel. They stopped that day and have not put their thumbs in their mouths since. I, as an adult, cannot fathom this. I've been trying to stop biting my nails for 29 years. HOOOOOOOOW? They just did it. I don't even know. 3) They've been fighting off an illness, which always makes for a rough go of things. But there is a new culprit in the mix, and one I'm just not ready to face (although I did and I will). The influences of other kids at school. Yesterday, one of my daughters tantrumed for a full three hours. Ninety minutes over a lollipop that she picked out and ninety minutes out of just general malaise. It may have been my hardest day as a parent yet. When pressed, one particular little girl, Natalina's partner for the school play, and the girl she now sits next to (that was a change from the previous month), kept coming up. M eats blood. M doesn't listen to anyone. M doesn't like me. M says mean things all the time. M likes me now and invited me to the "popular girls club" (INSERT MOM RAGE). M never does what she's told. She doesn't have to. M squeezes her hand hard to hurt her during play practice. M thinks she's a tattle tale. 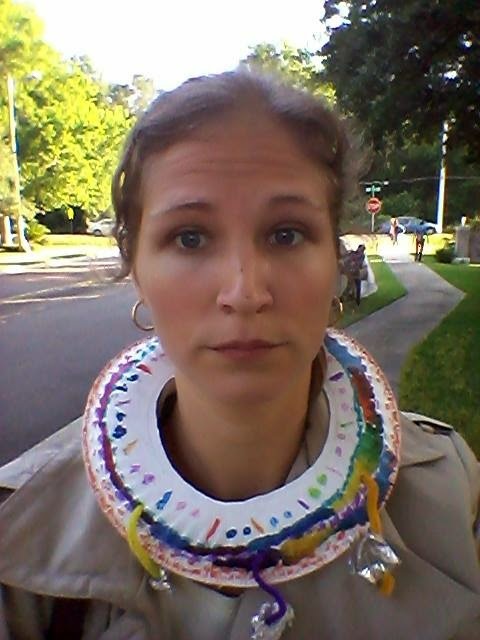 M, M, M, M.
In my I-mean-business trench coat and my paper-plate necklace, I prepared my talk in my head to the teacher. When I got there, though, the tone of the talk surprised me. "Hi, Mrs. G, I'd like to ask you about M."
"Okay, good, so you know what I'm talking about. What's up with that?" She took a moment. "We have lots of trouble with M. Has she said anything ugly to your child?" "Well, kind of," I replied. "They're partners in the play and I know Lilly sits next to her now. We're having some behavior issues at home, and I know you had to send L to the office the other day for attitude. I was just wondering if you could move her back to sit next to G?" She hesitated again. Now, this is a longterm substitute. Natalina's teacher had a baby, and left just a few months ago, if that. Her old teacher knew that N has trouble finishing assignments, and needs a good example to follow. N picks up on cues really easily, so when paired with G for so long, she began finishing assignments and setting a good example for others. N picks up on cues really easily. So, when Mrs. G told me that Natalina was a "strong leader" and she needed to "keep a good kid at each table" and mine was "one of the good kids", while my heart filled with pride (and recognition...they used to do this to me in school, too), I knew it was all wrong. My child is not a strong leader. And that's okay. She will be. I have no doubt. But she's not there yet. The person the substitute thinks my child is, and who my child actually is are two different people. Natalina picks up on cues really easily. For now, because I was not expecting that response at all, I let it go. The teacher is going to monitor the situation more closely, and there are only two weeks left of school anyway. But, in reality, this is only part one of the talk. I need to, now that I know what I'm dealing with, go back in there and get my kid what she needs. This may well be the one time in my child's life where being thought of as a strong leader will be detrimental to her, but so be it. My child is not yet a strong leader, and I will defend her malleability as she grows into one. So that one day, perhaps, yes, the teachers will make her the leader of the table of kids who have some trouble. Today she is just learning how to overcome her own trouble. This is a crossroads. An important one. These kinds of events could determine how my daughter deals with outside influences for the rest of her life. So, for now, I've instructed her to be nice to everyone, including M, but to know that she needs to do the right thing, always, and not follow along if she sees M behaving inappropriately. That whether or not M likes her bears no consequence on her life. God, I hope it sticks. I'm rooting for you! I hope you will find the solution which is best for your kid and not for everyone else. College admissions essays are notoriously complicated to write. The questions tend to be the exact same from year to year, which means the persons reading them have seen just about everything under the sun at that point. found my essay right here for quality and on time writing services with responsible cost.